Strolling the charming, walkable downtown, it’s easy to see why residents are proud of their history. The well-preserved colonial, Federal and Victorian architecture shows how long the place has been around – since the mid-1600s. But it was in 1813 that the town’s reputation was made. Facing attack by British war ships, the crafty Episcopalian settlers – who grew tobacco, and later wheat – hung lanterns on top of masts and tall trees. As a result, the cannons overshot the town, and only one home was damaged. If you can get past the sad fact that local restaurants now have to import crabs frequently, your first meal in St. Michaels should be at the legendary Crab Claw – just as ours was. Overlooking the harbor, it’s THE place to don a bib, crack some claws and watch the ships. We arrived to find my friend’s wedding party and other early guests slurping down mounds of crab and pitchers of beer amidst a rather strong aroma of fishiness. They didn’t seem to mind the smell, but I opted for the tasty crabcake sandwich. I know, I know – heresy. But it’s not just about the Old Bay Seasoning here. Two days later we found our way to Sugar Buns Bakery (pictured above), where I enjoyed a sweet potato biscuit drizzled with honey. It was rich and dense and more like a meal than a biscuit. 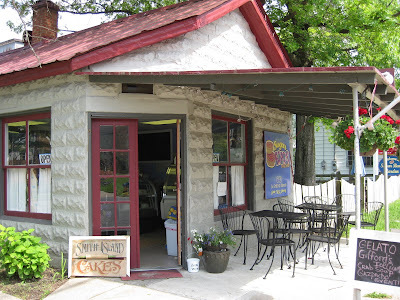 Sugar Buns is also known for its cakes, including the St. Michaels/Smith Island Cake, aka the Official State Cake of Maryland. 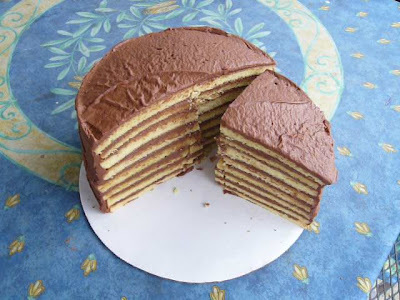 It’s a yellow cake with seven thin layers of chocolate icing. We’d enjoyed a slice the day before while the wedding party took a tour the bay with Captain Ed aboard the restored H.M. Krentz Skipjack. I managed to not get sunburned (which for me is a real accomplishment), but unfortunately, none of us managed to completely shake off Captain Ed’s long and depressing assessment of the Chesapeake Bay’s health. Let’s just say the largest estuary in the US is in real bad shape – and getting worse. Fortunately, after an open bar rehearsal dinner and further drinks at the Carpenter Street Saloon, we perked up enough to mingle with the locals. 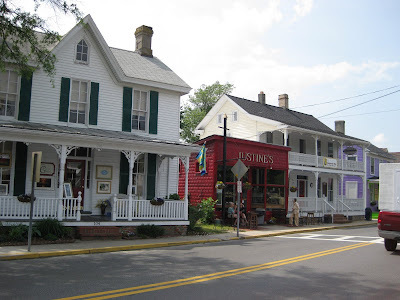 For all of St. Michaels' growing affluence and famous residents/visitors (Jenna Bush was spotted in town when we were there), the rollicking dive was a reminder that real people live here too. By Saturday, though, we had stepped back into the fantasy life. The bridesmaids got ready at the gorgeous “estate home” my friend’s parents had rented, which had a fantastic old barn – converted into a game palace with ping pong, pool, air hockey and more – as well as a swimming pool, a pool house, a rose garden and a big blue sailboat docked in front. 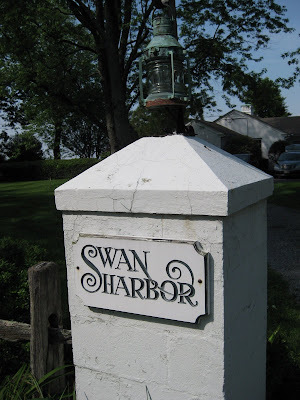 Though nowhere near as posh, our own rental house, Swan Harbor, had exceeded expectations too. 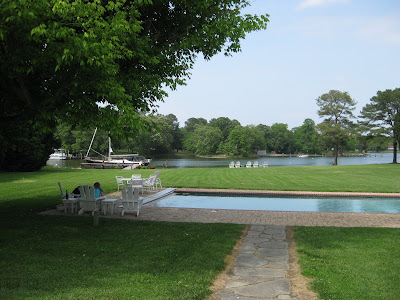 A rambling white brick waterfront home, it sat on a tree-lined drive with its own private dock. Though I fawn over B&Bs, St. Michaels rental homes are surprisingly affordable and the way to go here if you’re with a group. 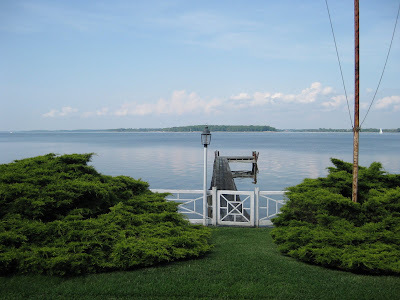 Speaking of lodging, St. Michaels is home to over 20 B&Bs, but the Inn at Perry Cabin (an 1812 country manor turned into a hotel in 1990) is the town’s best-known and swankiest option – a massive compound with big white columns and Adirondack chairs dotting the waterfront grounds. It’s old-school luxury with all the modern amenities, including an Aveda spa. See below for a stunning view of the Inn from the water. The wedding reception was held here, and it began with a sunset cocktail hour on the patio. Let’s just say it simply doesn’t get better than that time of day at this kind of location. 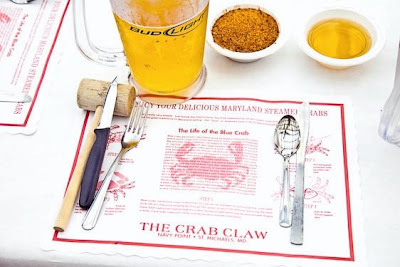 Crab Claw place setting photo credit: Ron Lynch.